I'm having to dredge the archives to find pictures for each post, it's been so dull and cold and wintery for so long now there is nothing current that's attractive enough to share. Or maybe that's just me. 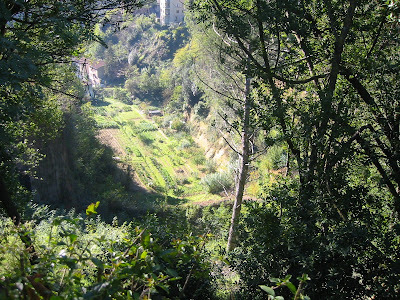 Anyway, this is a shot taken on a trip to Siena ages ago showing lovely vegetable plots in a valley within the town. In desperation I planted garlic in pots today. I've been waiting and waiting for a moment when the ground will thaw for long enough for me to get the cloves into the garden and the moment still hasn't come. I don't like having a lot of potted plants to tote around the place but there seems to be no alternative if we're to have reasonable sized bulbs this year. I'm also fretting about the Martock. In the end nearly all of the seeds, even the mouldy ones germinated so I have 25 little plants getting leggy and etiolated on the bedroom windowsill at the mercy of the cats because it's been too cold to put them in a greenhouse economically. By now I would be expecting to keep the glass frost free with a minimal amount of heat overnight but as the outside temperatures are barely coming above zero even in the daytime it would be a bill too far. I've already lost nearly everything in there and I'm keeping my fingers crossed for what's left. And I've no room to start anything else indoors, nursing as I am the peppers and aubergines on the bathroom windowsill. I do wish this awful winter would end. i agree about the weather. mud, mud and more mud. grumpy horses and wind and rain. bah! ps the word verification thingy was 'boost'!